The Beach House sits right at the heart of Porthallow Cove, the beach is just a stones throw away and the coast path will take you from the doorstep down to Coverack Cove, on to Cadgwith and then Lizard Point. It’s a spacious 18th century detached cottage that’s retained its charming features, from wood beams to the inglenook fireplace where you’ll see the original bread oven and timber lintel. However the cottage isn’t without its 21st century comforts, you get WiFi, electric heating and a dishwasher! Entered from the road into the open-plan ground floor living, dining and kitchen areas. The living room has sofas and chairs gathered around the wood burner that sits in the deep inglenook fireplace with a flat screen TV to one side. In the kitchen are fitted units with oven and grill, 4-ring hob with extractor over, microwave, kettle and toaster. The dining table is positioned between these two parts of the room and seats six. The utility room is equipped with a dishwasher and washing machine and leads to the ground floor bathroom where there’s under floor heating, corner bath with shower over, WC and a handbasin. An external door from the utility room opens to the small service yard at the rear. Also on the ground floor is a children's bedroom with bunk beds, there are books, games and some storage space. Upstairs, both bedrooms are off a landing. The main bedroom is quite spacious given the age of the cottage; it has a double bed, features lots of storage and looks out onto the quiet village. There’s a built-in wardrobe, chest of drawers and bedside tables with lamps. The second bedroom is en suite and has twin 3’ single beds, built-in wardrobe, small chest of drawers and a bedside table with bedside lamps. The en suite has a shower cubicle, toilet and handbasin. There are some sea views from the side window of this bedroom. The Beach house is heated by modern instant heat electric radiators. 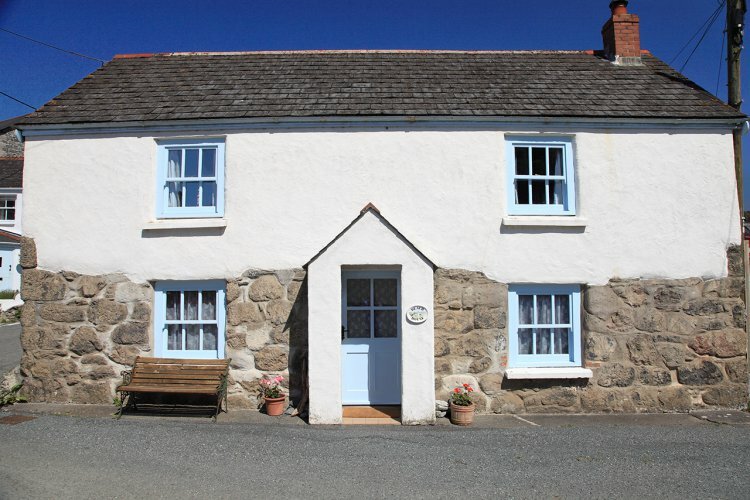 Parking is directly in front of the cottage and additional on road parking is usually available nearby and just beyond this is the attractive shingle beach and the well renowned Five Pilchards, a 300 year old pub which serves hearty meals. Rental includes: bedlinen, towels, WiFi, electricity and parking. Two well-behaved dogs will be accepted by payment of £25 per dog per week at the time of booking.